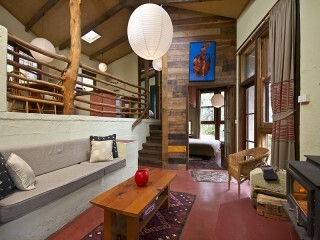 Valley Cottage is one of two architect-designed eco-cottages set in 12 acres of bush. The Cottage runs on solar power and is split-level, with 3 bedrooms (2 can be configured as singles or kings – 1 bedroom has a double and single bed), two bathrooms, dining and living areas and fully equipped kitchenette with fridge and gas oven. You will also enjoy the warmth of the slow combustion fire in Winter. We provide all linen including towels, tea, plunger coffee, milk and sugar. Breakfast hampers and dinners can be provided for an additional charge. There is a terrace with outdoor table and BBQ to help you take advantage of the mountain air. 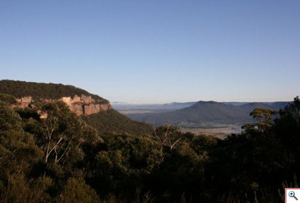 You will find a stunning view of the Kanimbla Valley from our clifftop lookouts, a short walk from your cottage.